Before it became world renown for wind surfing, Hood River was known for its apples, pears, cherries, peaches and other succulent treats. Vineyards dot the countryside and produce stands sell their luscious treats by the road. 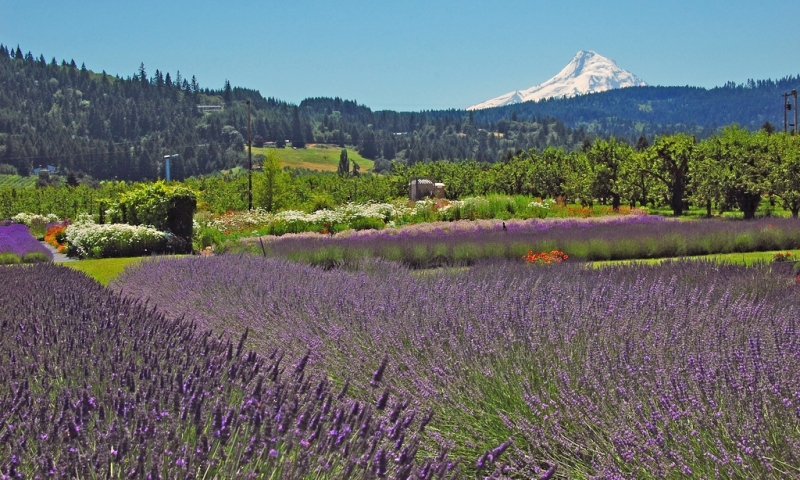 Along with the sweet bounty of the fruit orchards, Mount Hood's iconic peak makes the Hood River Valley the picturesque destination that it is. One the most memorable ways to see the orchards is via the Mount Hood Scenic Railroad, which goes through apple and pear trees. The railroad cars are from the early part of the 20th century and propelled by a diesel engine. Following the old fruit train line route between Mount Hood and the Columbia River, spring is the best time to see the valley in all of its blossomy wonder. For those that wish to view the orchards on their own schedule, a 35-mile fruit loop goes through the valley's orchards, farmlands and small towns. The route follows Highway 281 and Highway 35. Along with the fruit orchards come many vineyards, which produce some of the finest wine in Oregon. Wine tasting is a popular activity after a day of hiking, biking, sailing, or watching windsurfers (the best viewpoint being the Columbia Gorge Sailpark) for those enjoying all that Hood River Valley has to offer. Beautiful mountain valley in Northwest Montana.